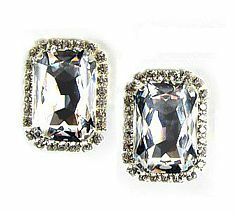 A delightful, slightly smaller version of the mighty Swarovski crystal Rectangle earrings. Like the fullsize version, these mini-masterpieces of sparkle have been meticulously, precision-cut to perfection so as you look into the crystal, it appears to go on into infinity. And to add to the shimmer, each rectangle is surrounded by small Swarovski crystal circles to give a retro look and feel inspired by the Art Deco era. Size: 2.5cm x 2cm (1" x ¾").